Contains username and email account for the logged in TeamViewer user. Contains certificate information and client version number. Contains the remote id number of the device being connected to, the start and end of connection timestamps, the purpose of the connection, the Android's device name and a GUID like number. Text search the term 'participant' within the file to get the partner's device name. Text search the term 'creating file' to obtain the names of transferred files. Text search the term 'a=' to obtain the connection IP address. Recently I was catching up on some great digital forensics tutorial episodes at 13cubed, whic are made by @davidrichardg. In one of the videos he was talking about RDP cache data left on Windows systems. (I highly recommend his content and hope you can also become a Patreon supporter here.) 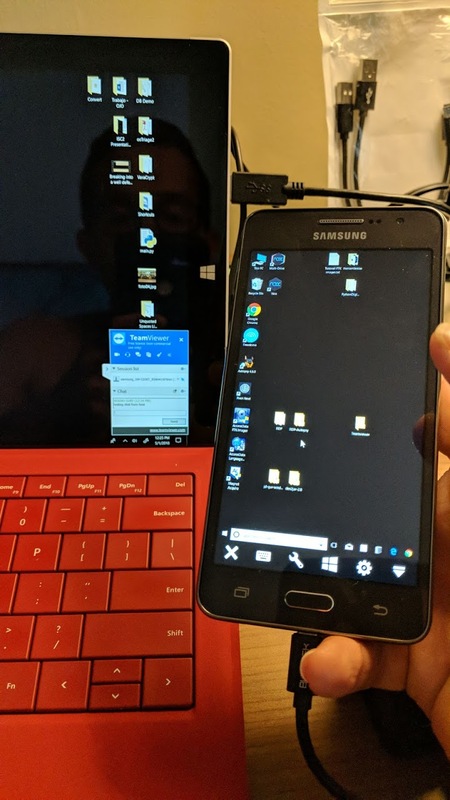 His video left me wondering what type of artifacts could be found by the use of RDP and remote control apps in Android systems. Hence the idea of starting a small series on remote control artifacts in Android. I plan to look at both client and hosts apps. To start I decided to look at the TeamViewer remote control app. App in the Google Play Store. TeamViewer (TV) is a really well know remote control platform that has been around for quite a while. The current Android remote control version in the Google Play Store has over 10 million downloads and they state that over 1 billion devices have had their software installed in order to enable remote connections to them. First step was to install the app on the target device. A Windows Surface laptop served as the device to be connected to. After logging in to TV in both devices I was able to successfully remote control the laptop from the Android device. I was also able to transfer a text file from the laptop to the Android device. After reviewing the contents of the folders it seemed that most of the pertinent artifacts the app generates are located in plain log and configuration text files. Most of these files were located in the properly named 'files' folder. The following is a quick description of the most salient files in the folder. This text file contains the remote id number of the device being connected to, the start and end of connection timestamps, the purpose of the connection, the Android's device name and a GUID like number. This configuration file contains certificate information and client version number. The Xs represent the client ids involved in the communication. Each line in the TVlog.html file has a corresponding timestamp which I did not show in the previous examples due to formatting issues. Depending on the device in question, the TVlog.html file could reside in an the external SD card. For upcoming posts I will review the Android TeamViewer host app followed by the Microsoft RDP client for Android.